The rigor of becoming an Airborne Ranger is exceeded only by the challenge of being one - but those who join their ranks find fulfillment in something bigger than themselves. In the same way, pursuing God's objectives energizes our everyday lives. Former U.S. Army Ranger Chuck Holton shows how God oversees our training and gives each of us specific skills to accomplish the mission He has for us in this great spiritual war. Riveting action and powerful vignettes offer potent spiritual ammunition for the battles of every Christian serving in God's army. 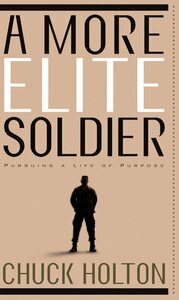 Find out what it takes to be a more elite soldier. About "A More Elite Soldier"
You're on an elite mission. Find potent spiritual ammunition for your daily battles in these riveting stories by a former U.S. Army Ranger. From the instant the alarm clock signals the beginning of your day, you’re jumping into a zone of uncertainty. Your survival depends on having a clear focus. Get on mission as an elite soldier. Become part of something bigger than yourself. Your Commanding Officer will oversee your training, honing your skills to a razor-sharp edge. God will lead you through the danger zone of today’s insecurity, equipping you to make a difference. In this riveting book, you will be issued potent spiritual ammunition for your daily battles from the perspective of a seasoned Special Operations soldier. UNCERTAINTY IS A GIVEN. FEAR IS OPTIONAL. Chuck Holton spent four years with the 75th Ranger Regiment, flew military helicopters and now travels the world as the "adventure Correspondent" for CBN. He is the author of five books, including the Task Force Valor Series, "A More Elite Soldier", and "Bulletproof: The Making of an Invincible Mind". He splits his time between his home in Panama and his farm in Appalachia, where he enjoys raising animals with his wife and five children.